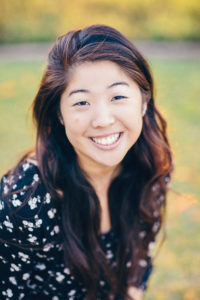 Traci Matsushima, AACF CSULB class of 2014, responded to the question, “How has AACF impacted your life? Many of us think that college is the time where we learn the most about ourselves—I know I did. Going in as a freshman, I thought that college would be the place where I discover myself. I went in thinking–this is my new start. This is where I learn about my passions, my interests, my strengths. This is where I will be molded, equipped and encouraged to embrace who I am, to pursue my dreams and to pave the path for my future. This selfishness even manifested itself when looking for a campus fellowship. I went in with the same mentality—does this ministry fit my needs? Does it meet my expectations? What I brush off as just being my individualism and introversion, was ultimately my pride. It was this deep-seated pride that narrowed my concerns to my own immediate wants, desires and problems, cutting me off from seeing the value in community. The Lord was so gracious and patient as He began to humble my heart in revealing to me His truths through the Word. I remember reading through the gospels and being so convicted of how Jesus did ministry. He had compassion on people, He walked and ate with people, He taught people, He surrounded Himself with people. I remember thinking—if God is a relational God, and He created us in His image, then we are inherently relational people. In fact, the very foundation of community in our Christian lives rests on God’s Trinitarian nature. So how can I claim to be a follower of Christ and not invest in community? I admit that it was uncomfortable adjusting to AACF at first. I often had to fight the urge to make it about myself. But it was in this discomfort that God was refining me to see beyond myself and look to the needs of others, to quit focusing on myself and start focusing on Him. When I submitted my own agenda and pride to God, that’s when I found the most peace and joy. Seems like such a basic concept, but it’s honestly something I need to ask the Lord to refine me in daily. AACF became a place where I grew in my knowledge and reverence of who God is. It was a community that completely widened my perspective of ministry. In AACF, I experienced the kind of fellowship Paul talks about in Philippians 2:1-4 as I served alongside brothers and sisters and as we carried each other’s burdens (Gal. 6:2). It was in this true fellowship that I saw the heart of God. It spurred on a deeper intimacy in my own relationship with the Father as I saw how sweet our calling to participate in the richness of fellowship with God and others is. My freshman year, I wanted to learn about myself. God sure did teach me about myself —that I was a fearful, prideful, ignorant, self-seeking, destitute little human. This was the greatest thing I could have ever learned about myself. What a beautiful promise that is in the Christian life—we learn the most about ourselves when we begin with the One who created us.